Our patients are the heart and soul of our practice. Each one is special to us, and being able to be a part of their journey to their true selves is an honor and a privilege. When we receive a heartfelt patient review like the one below, it confirms to us that what we do every day does make a difference! Well, that’s very simple: Dr. Graivier has a mind full of wisdom and crazy knowledge. He has eyes that see the very best in you. He has hands that design, sculpt and create a new you. He has feet that stand firmly beside you each step of the way.? But my most favorite of all is that his heart is full of compassion and love, and that he has a burning desire to love others and help them reach their dreams.✨? 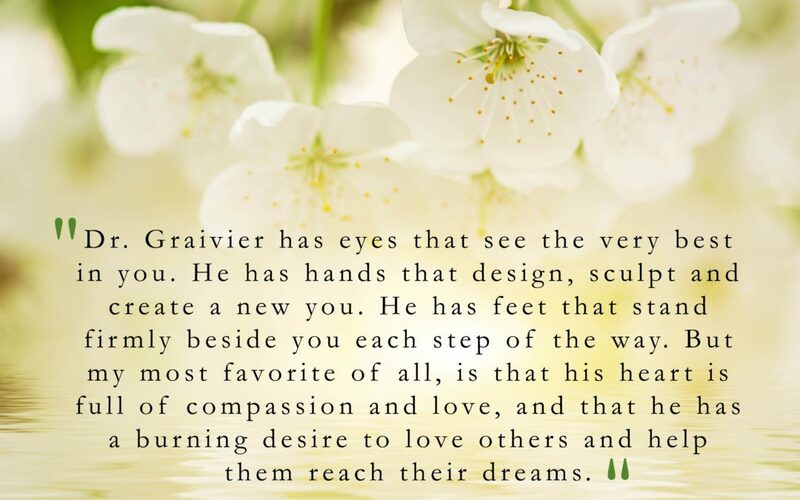 Dr. Graivier is the closest thing to perfect I’ve ever known, and when I count my blessings I count him and his staff twice. They are not just a surgeon and staff they are my friends who have loved me through this process. ? I consider myself one truly blessed girl that God brought each of them into my life. So, let nothing keep you from your dreams — reach for the highest star.? The reality is if you want something bad enough, you will push yourself to be the best you that you choose. ✨? ?